5 bedrooms, 14 guests, peace & privacy, private pool. Golf course views. Close to many restaurants, cafes and bars. Central Festival - biggest shopping centre in Phuket only 3 kilometre. New villa completed January 2019. Large 5 bedroom villa all with ensuite bathrooms, on the Phuket Country Club golf course, in a private gated development. Sleeps up to 14 persons. All rooms have unobstructed golf course and rain forest views with total privacy. Private Pool (6mx6m) is screened off from the golf course by plants and trees. Large master suite with 2 king beds, en-suite shower & twin basins. Golf course views. Bedroom 2 with 2 king beds, en-suite shower & twin basins. Rain forest view. Bedrooms 3, 4 & 5 occupy the top floor, queen beds, ensuite shower, rain forest & golf views. Linen and towels are included. Fully equipped kitchen with fridge, freezer, cooker, over & dishwasher. Free wifi & private parking. Private 12 seat mini bus available. 1000 baht airport transfers or a full day with driver for only 3000 baht. 3 kms (5 minutes drive) to Central Festival, Phuket's biggest indoor shopping mall, cinema. 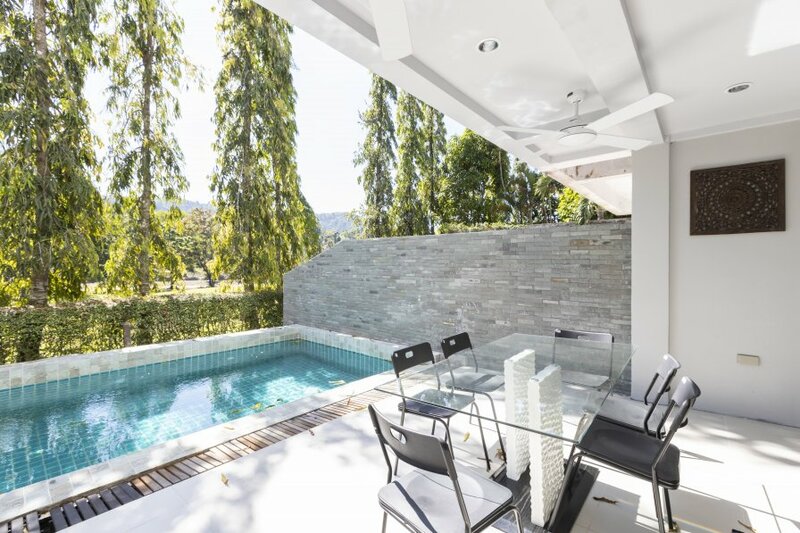 Best location to enjoy all that Phuket has to offer. Peace & quiet guaranteed but only minutes from restaurants, cafes & bars, luxury spa for massage & beauty treatments.